During the webcast, Greg Bennett will discuss activity during the quarter and give an overview of the fund's very encouraging maiden year, as well as discussing current fund positioning and the positive outlook for the fund. During the webcast, Barry will discuss activity during the quarter and give an overview of the funds' performance in 2017, as we as discussing current fund positioning and why a fund focused on stock picking can flourish in 2018. During the webcast, Barry will discuss activity during the quarter and give an overview of the fund's sector leading performance 2017, as well as discussing current fund positioning and why a fund focused on stock picking in long and short books can flourish in 2018. During the webcast, Greg Bennett will talk about the objectives of the fund, activity during the quarter, current fund positioning and the outlook for the fund. During the webcast, Barry will discuss activity during the quarter, as well as discussing current Fund positioning and the outlook for markets. 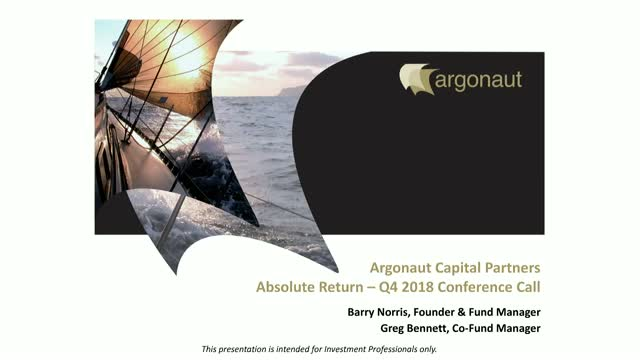 The Argonaut Investment team shares their latest thoughts on European equity markets and the positioning of their funds over the past quarter.